Not only are you going to feel as if you are on a tropical island enjoying this e liquid, but the throat hit you are going to get is going to feel as if a volcano just went off. Lychee Lava is the name of the e liquid that is going to be fruity and sweet. When you take the first pull, you are going to taste the pear flavor making its way into your mouth. The peaches are going to taste fresh and plump as if they were picked when they were ripe in order to be included in this e liquid. Perhaps the peaches were shipped from Atlanta, Georgia to whatever tropical island you are hanging out in. As you keep pulling, you are going to taste the succulent pear flavor scattering around your mouth and giving you all of the juicy notes falling on your taste buds. The lychee taste is eventually going to welcome itself in because it wants you to get a lot sweeter notes when you help yourself to this e liquid. As all of these three flavors come together, you are going to feel as if they have suddenly turned into some lava and start to smoothly continue to make its way down your throat. This is because it is going to give you the throat hit that you deserve. It is not going to be too intense so you will not have to brace yourself and expect an explosion. There is still going to be an eruption that allows these fruity flavors to get more potent. Exhaling might even be an amazing experience as well because you are going to meet a couple of your cloudy friends that will allow you to admire their size and scent. A cloud show that is going to make you want to go on several more trips before you put this e liquid down. Brought to you by the award-winning Candy King. 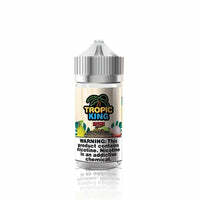 Lychee Lava - Tropic King E Liquid has a rating of 2.5 stars based on 2 reviews.